I always say that the health of your body is a window into the health of your finances. The opposite probably holds true as well. You cannot be physically healthy without financial stability, and you will never be financially stable if you are not physically healthy! The following is a guest post written by friend, financial coach, and mommy blogger Amanda Sharratt. This post is less about money and more about her journey to accepting and loving her body…and how it has positively influenced her daughter. After you read her inspiring story, I highly recommend you check out her blog and follow her on Facebook and Instagram! She is down-to-earth and always posting motivational tips, tricks, and life hacks! As a Financial Coach, I often talk to clients about changing their habits and avoiding the negative self-talk when it comes to money. Money can cause all kinds of emotions. If you are living paycheck to paycheck, you are stressed about money and likely not very confident in handling money. This reflects in the way that you speak about money and about your ability to manage money. And whether we like it or not, if we have kids, they notice. They might not know the exact extent of the money problems but they can feel the stress in the house. I see this time and time again with my clients. They come to me and tell me they feel so bad about how this is affecting their kids. Then, by the time we are to the end of our coaching, they almost always comment on how their kids' behavior has changed and they are actually asking if something is in the budget! What I noticed is that kids are ALWAYS watching. This is not only with finances but it is with just about everything in life, including health and fitness. I know this because I realized how much my daughter copies my habits, even from an early age. For instance, one day she stood in front of my full-length mirror and looked at her outfit and fixed her hair - the EXACT way I do before leaving the house! I was like...”where did you learn…" Oh, never-mind. I know. At that moment, I knew I needed to really start paying attention to the way I was looking at myself in the mirror. Am I tugging on my shirt that fits a little too tight? Do I feel discouraged by the way I look in that dress? Am I speaking negatively to myself, whether out-loud or in my head? She is going to notice! I also realized that I needed to start watching how I speak about food, health, and fitness in general in the house. Many times, parents - and especially moms... are way more willing to make a change because it would benefit their kids rather than because it would benefit them. I'm not saying that is good or right. I think we should do things for ourselves! I fully believe that we aren't good for anyone if we aren't taking care of ourselves. But I know the reality...we would do anything for the kiddos, and we often come last. Here's the thing...that can actually be great motivation to make habit changes that will ultimately make you healthier and happier! When we are talking about health, this looks like changing the way we speak to and about ourselves because we would NEVER want our daughters to feel that way about themselves. I can tell you that since that incident with my daughter that I mentioned above, I have been VERY aware of the way that I treat myself or talk about myself. This is because it would literally break my heart if I EVER heard her say anything negative about herself. She is beautiful and wonderful and perfect. Here's the truth...so are you. We all are. Let's stop beating our selves up and start loving these bodies we have. 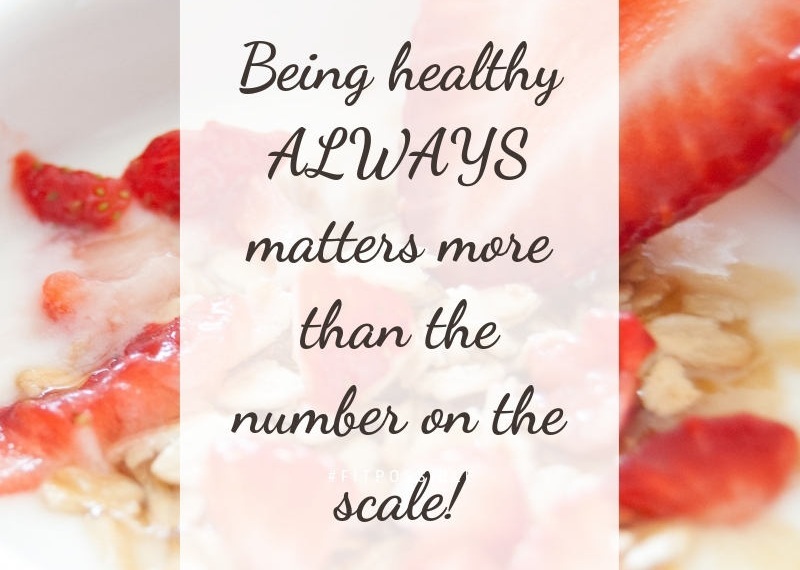 If there is one main thing that I have learned from Kelly, it is that we need to focus more on being HEALTHY than a number on the scale. I think that is so important, especially when it comes to kids. What if our kids didn't grow up seeing us diet? Didn't grow up thinking they had to look a certain way? What if they didn't grow up thinking working out was a punishment? What if instead...we could teach them about HEALTH. That we eat certain foods and move our bodies because we want to be healthy. Because we want to take care of these precious bodies we were given. THAT is exactly what I want for my daughter. I want her to know she is beautiful and strong and amazing just as she is. Eating an Oreo doesn't change that. That we work out and eat healthy to celebrate the body we have - not to beat it up for eating that Oreo. My commitment to changing my habits and mindset around health was driven by the desire to see my daughter have a healthy relationship with food and fitness and body love. I believe all of this is a process. You don't arrive at a place of loving your body and thinking positively about food and fitness all the time. That's not what has happened for me, at least. For me it is more about a commitment to thinking and believing this way and shutting out the negative voices that always seem to want to creep in! I have committed to changing my habits and shutting out the negative self-talk and it has impacted myself and my family in a big way! Thank you for your wonderful perspective Amanda! Amanda is a wife, a mom, a blogger, and a speaker. She is also a Financial Coach that is a spender at heart. Her passion is to help people find new ways to spend smarter & save more, all while living a comfortable life. After Amanda and her husband paid off $141,000 of debt in 3.5 years, her heart was on fire to help others experience freedom from debt! You can learn more about Amanda and read her money-saving articles at AmandaSharratt.com.